Puppy barking and chewing is usually something every poodle pup owner deals with. Puppies will chew, and they will bark. Buy dog chew toys to satisfy your dog's chewing. Keep items you don't want chewed out of her reach. A kong dog toy can hold treats like biscuits or his favorite dog food which entice your dog and encourage chewing. Use different sized biscuits so some fall out and can be eaten while the larger ones remain in the toy to fascinate your pup! Nylon bones, and hard rubber toys are other good chew toys. Some chew toys can be stuffed with peanut butter. A frozen washcloth is a good chew toy for a teething pet. An older dog may chew because he's nervous or anxious. Puppies chew when they teeth because it makes their gums feel better. Chew toys are effective for when you want your dog to be quiet, such as when he is in his crate. It will keep him occupied, teach him to enjoy solitude while chewing on his toy. It also helps foster chewing his toy while home alone and not barking excessively or chewing household items. Chew toys also prevent the buildup of plaque on his teeth. When you catch your poodle pup chewing on something she shouldn't be chewing on, firmly say "No" and give her a chew toy. When you see her chewing her chew toy and not your shoe, say "good girl!". Dogs bark! That's how they communicate. 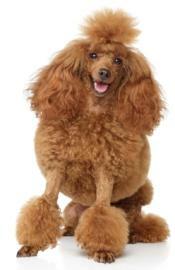 But if your poodle's barking is excessive or annoying there are ways to control it with barking dog training. Your poodle can be outside barking because she's bored, other animals or people are walking by or she wants to come in. If she's bored, play with her. If a lot of people walk by your house, install a solid fence. But then that might make her more bored! If she barks constantly indoors, it could be from something going on outside. Turn a radio or tv on to mask the outside noise. You can get a treat, tell her "quiet" and when she stops barking give her a treat. 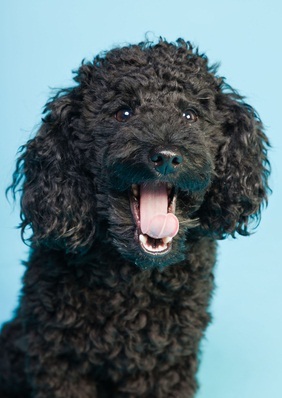 Indoor barking also occurs due to separation anxiety because your poodle is lonely. Take her for a brisk walk or play a game with her to tire her out. She's more likely to sleep when you leave instead of barking. Puppy barking and chewing will be lessened with training. A lot of puppies grow out of chewing once they are done teething.